At every level, mentorship is a win-win experience for all involved: students, mentors, employers and communities. The NMSU College of Business recognizes the value of this practice and has established the Mentorship Scholarship Award to help more junior- and senior-level students discover success through mentorship. With assistance from the Business Advisory Council, the award expands mentorship opportunities to more NMSU students every year – covering expenses such as student-based financial assistance, experience-based industry travel opportunities and one-on-one career coaching. Kevin feels so strongly about his experience with his mentors that he’s already looking for ways to become a mentor himself. 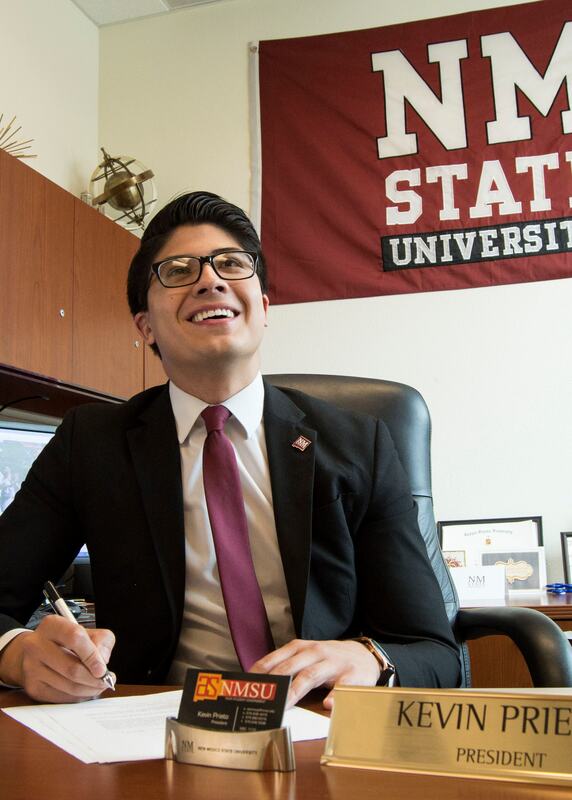 “Even though I’m a senior and my time is almost up, there are many other students behind me who are ready to make a difference at NMSU and eventually, the world around them,” he said. Help us expand our mentorship community so NMSU business students of today can become the business professionals of tomorrow. Your gift will provide students with the tools they need to navigate opportunities for career growth and become effective leaders and stewards of the economic, political and social systems in their communities. Your donation of $25 is an investment in students and makes an impact as we mentor future leaders. Your donation of $50 is an investment in students and makes an impact as we mentor future leaders. Your donation of $100 is an investment in students and makes an impact as we mentor future leaders. Your donation of $250 is an investment in students and makes an impact as we mentor future leaders. Your donation of $500 is an investment in students and makes an impact as we mentor future leaders. Your donation of $1,000 is an investment in students and makes an impact as we mentor future leaders.